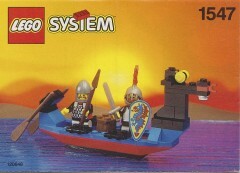 Today's random set is 1547 Black Knights Boat, released in 1993. It's one of 14 Castle sets produced that year. It contains 58 pieces and 2 minifigs, and its retail price was US$4.25. It's owned by 1349 Brickset members. If you want to add it to your collection you might find it for sale at BrickLink or eBay. What a terrifying dragon figurehead! I don’t think this set is “see” worthy. I miss the Castle theme... Anyone else?? Is noöne going to mention the fact that we've had two classic Castle sets in a row and therefore the Huwbot algorithm must be broken and\or rigged? Wow I guess huwbot’s new favorite theme is castle instead of Clikits. @jlskywalker Agree 1000% PLEASE BRING CASTLE BACK! I just love those beautiful shields. I ended up with plenty of the that had the green dragon design, but I don't think I ever bought many with the blue dragon, like this one. Not the most glorious set but I think I can build it with my existing spare parts. I have to agree that this is probably not one of the greatest Castle sets. But then again it's a boat, which wasn't one of the main focuses of Castle after all. I like the mid-80s wave auf knights better. We've had two classic Castle sets in a row and therefore the Huwbot algorithm must be broken and\or rigged. I like to think of this set as the Sea Serpent’s life boat. Two retro Castles in a row? Well, I'm not complaining! Personally, I'd rather see Space come back before Castle does, as a bit of a Sci-Fi nerd, but it has been a shamefully long time since we've had one. Luckily Ninjago is around to fill my Dragon itch! It's pretty fun when boats and ships show up in Castle sets! We haven't seen any in a traditional Castle theme since Fantasy Era, but LEGO Elves did give us the gorgeous #41073-1 and #41181-1. I felt like it was a bit of a missed opportunity not to see any boats in Nexo Knights sets besides the dinghy in #70352-1, since it would be very easy to make a boat or hovercraft in a shape that closely resembles the pentagonal shape of the heroes' shields. 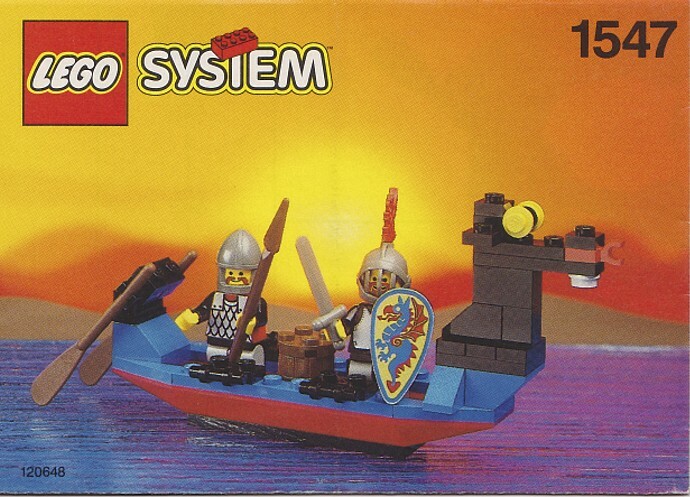 Hopefully the next take on LEGO Castle might dabble in boats or some of the other types of subjects that haven't shown up in Castle sets in a while! I had set 6049 , which was more of an boat + 5 Crusaders minifigs with extra shields/spears battle pack. The dragon head on this set is much better however. Great set. One of the sets I ordered on BrickLink in the U.S.A. It is a nice addition to my Castle collection. One of the first sets I bought. My budget as an eight year old didn't allow much else. It is great to see a Castle set! !